In previous works, the authors showed advantages and drawbacks of the use of PCA and ICA by separately. In this paper, a comparison of results in the application of these methodologies is presented. Both of them exploit the advantage of using a piezoelectric active system in different phases. An initial baseline model for the undamaged structure is built applying each technique to the data collected by several experiments. The current structure (damaged or not) is subjected to the same experiments and the collected data are projected into the models. In order to determine whether damage exists or not in the structure, the projections into the first and second components using PCA and ICA are depicted graphically. A comparison between these plots is performed analyzing differences and similarities, advantages and drawbacks. To validate the approach, the methodology is applied in two sections of an aircraft wing skeleton powered with several PZTs transducers. Tibaduiza, D.A. [et al.]. 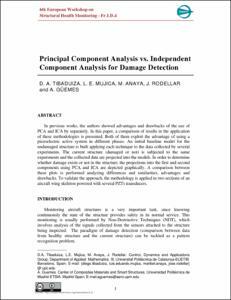 Principal component analysis vs. independent component analysis for damage detection. A: European Workshop on Structural Health Monitoring. "Proceedings 6th European Workshop on Structural Health Monitoring & 1st European Conference On Prognostics and Health Management, July 3-6, 2012, Dresden, Germany". Dresden: 2013.